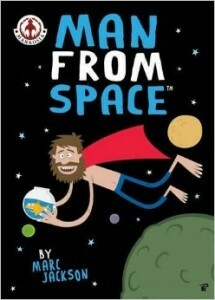 Man from Space is an original graphic novel by cartoonist Marc Jackson and published by Markosia Publishing. Released in September 2014, this original graphic novel contains a collection of newspaper strips and original content created by Marc Jackson that have been published in newspapers both in the UK and US. The story follows, you guessed it, a Man from Space who crash lands on a planet after leaving his goldfish, Michael to pilot the spacecraft. Hijinks ensue after the Man from Space is knocked out and awakes to find a strange alien named Whemblo who informs him that his goldfish cared for him while he was unconscious and has built a teleporting robot. The robot teleports the Man from Space to a desert plane where he meets the head of the desert and enlists his help and that of a scientist named Dr. Brain to fix the malfunctioning robot and travel back to his goldfish companion. The final chapter follows the Man from Space, his goldfish Michael and a tiny Spanish man named Kid Whiskers as they climb a cliff face in search of adventure. If I had to explain this comic to someone, I would probably say that it is like mixing Adventure Time with Wallace & Gromit. The art style reminds me of the type of animation that is employed by Aardman Studios and it definitely helps to add to the absurdist flavour of the stories being told here. The bright colours and cartoonish style of artwork employed here are somewhat of a signature for Marc Jackson and in this type of storytelling, I cannot honestly think of anything better. It should appeal to kids and adults alike as there is always something happening in each and every panel to engage your interest. The Man from Space seems to me to be a lot like the titular character from Mork and Mindy. His behaviour is a little erratic and he doesn’t always seem to know quite what is going on. This is really well played up against the goldfish, Michael who always seems to be getting into all kinds of trouble despite his lack of opposable thumbs and inability to speak English. Marc Jackson does a wonderful job of making this book into a fun, all ages adventure that can be enjoyed by anyone. There is nothing that you need to have read before picking up this book and I think that is going to be part of its appeal. If you are looking for a fun, all ages book that will appeal to almost anyone, then don’t look past this book! Parental Concern: None. I would happily recommend this book for children.